late in the afternoon 70 years ago my Mother got permision to slip away early from her secret radio ops. base near London – on condition she remained in Uniform – she had no idea why she had to wear uniform but what the hell it got her off ops. early! She was WRAF and now firmly grounded as her newly married husband said that 2 in the air was too many! Father had arranged to fly into Biggin Hill for a brief overnight stay and they were meeting for an early supper with some friends in a hotel near Croydon airport. They had dinner and everyone drifted away early. Later that night my Father slid quietly from their bedroom setting an alarm for my Mother – She was on orders and Father had just broken orders!! Mother heard the alarm and rapidly got up – not quite sure why she had to – dressed, rather blearily in the dark and was on the front steps of the hotel just as dawn was breaking. Those were her instructions!! Just as dawn broke she heard the familiar roar of Merlin Engines as a wing of Spitfires flew at roof top over the hotel waggling their wings – she spent the next 10 minutes helping a cleaning lady clear up the mess she made falling over a bucket of soapy water as she dived for cover! Then the sprint back to her station where at every opportunity for the rest of the day she tuned in to listen to my Father’s squadron as it provided the air cover on the beaches of the Normandy Landings. 1,000s died to give you and I our liberty! Only to be betrayed by political filth just a few decades later. Few things in my life have revolted me more than the glib willingness of the scum of the earth to squabble and back stab to get their snouts in the troughs on The EU Gravy Train. Even less edifying have been the filth that has crawled out of the gutters to lie and cheat, plot and scheme against decent honest people, who have no interest in personal reward, yet seek to liberate these United Kingdoms from under the heel of those to whom our politicians have betrayed us. 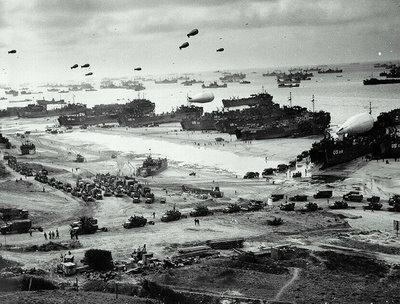 In a demonstration of raw courage, ingenuity, determination and sheer power, on 6 June 1944 the combined Allied Armies launched the greatest invasion fleet in the history of man onto the shores of Normandy – a feat never since equalled and never likely to be repeated. Many arrived – many fewer left. We owe them a great deal.